Craft beer drinkers, in fact those who partake in any alcoholic beverages, should never be complacent regarding legal alcohol. The threat to your responsible enjoyment of these beverages remains under attack. There are a number of organizations active today that seek a return to Prohibition. One, the Woman's Christian Temperance Union (WCTU) was founded back in 1874 and is still very much alive today. The group led the movement that gave us the failed social experiment of Prohibition and they have not given up their fight. This group has active chapters throughout the U.S. and in 36 countries around the world. The WCTU website states, "The members chose total abstinence from all alcohol as their life style and protection of the home as their watchword." In a publication on alcoholic beverage serving size, the WCTU states "No Alcoholic Drink Is Safe!" I find the organization's name to be very ironic. 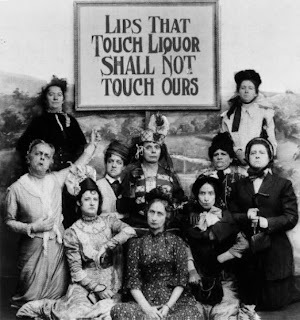 They call themselves the Woman's Christian Temperance Union. However, by their own words it appears they would not even allow Jesus Christ into their homes. It is biblically documented that Jesus Himself drank wine, and even changed plain water in fine wine for party guests. The WCTU made the news most recently when, at its 135th Annual National Convention in Burlington, Vermont, the organization presented the first annual WCTU Millstone Award to the Amethyst Initiative. According to the WCTU the award "was created to bring public awareness to a person, organization, or governmental body that creates or uses their position of influence to promote unhealthy, illegal, or immoral behavior that we believe places children at risk." Readers are reminded that the Amethyst Initiative was set up "to support an informed and dispassionate public debate over the effects of the 21 year-old drinking age." The Initiative is a call to study the issue and to develop better ways to protect our youth. The timing of the "first annual" award leads one to assume it was created especially to honor the Amethyst Initiative. Not only does the WCTU continue to work to ban all alcoholic beverages, they are apparently opposed to even a discussion that may serve to keep our youth safe from alcohol abuse. It's no surprise that the The Partisan Prohibition Historical Society, also known as the Prohibition Party, is listed in the WCTU site under the heading "friends of WCTU". Readers will recall the recent attempt by a small group in Virginia to warp Christianity to their own private interpretation. Be it local or national, there are numerous forces at work attempting to keep us from the responsible, and legal, enjoyment craft beer and other alcoholic drinks. Given the faces of those women in the picture, would anyone WANT to be kissing them? Of course these theological revisionists will tell you that Jesus didn't make water in to wine, but rather water into grape juice - which can neither be supported from a study of the Greek language or through studies of the culture at the time. The fact though that Jesus' wine caused a scandal because he created the best wine the revellers had that day is also lost on them. So when faced with a choice between "dat schlop" as the founder of Budweiser would call his own offerings, and a craft brew - what would Jesus do? Go for quality my friend, go for quality. Velky Al, thanks for the comment. I've added a link to your "Fuggled" blog in my blog links. David, thank you kindly! I enjoy reading your stuff, hope you get some pleasure from Fuggled.